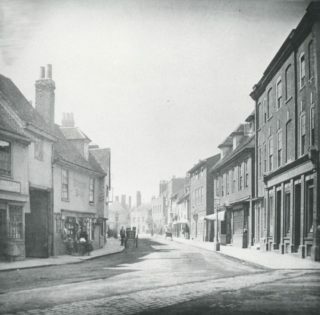 There have been quite a few changes to St Andrew Street in Hertford since 1911. Often referred to these days as the ‘quality street’ of the town, it still features many interesting and historic buildings, but the construction of the Inner Relief Road (Gascoyne Way) during the mid-1960s resulted in the demolition of a whole section of the street at its western end. The 1911 census and business directories of the time (Kelly’s Directory of Hertfordshire, 1910 and 1912 editions, and Bennett’s Business Directory 1911-12) reveal that there were several habitable yards and other residential areas off the main street, such as Rix’s Yard, Kiddill’s Yard and Oakers Buildings, but these also no longer survive (in name at least). One exception is Brewhouse Lane, which has been redeveloped in recent times and is very different now from how it would have been over 100 years ago. This article, which concentrates on the even-numbered properties in St Andrew Street, located on the north side, is the second of two articles about the street in 1911 – the first covers The south side. For reasons of space the various yards and other areas that used to run off the main street are not included here. The first building, on the corner of St Andrew Street and Old Cross, is No. 2, a large and impressive 18th-century townhouse. These days the building (including the part currently numbered 2A, which is called Queen Anne House) is Grade II* listed. In 1911 the census records a grocer and wine merchant, Otho Wigginton, living in this 11-room property. Aged 56 and from Hertford, he was married to Eliza, 54, who was originally from Winchester in Hampshire. They had five children – two daughters and three sons – all of whom had been born in Hertford. Kathleen Eliza, 38, was employed as a shorthand typist and book-keeper; Otho Stophen [sic], 26, assisted in the grocery business; Constance Gwendoline, 24, also assisted in the business; Francis Arthur, 22, was a surveyor in the building industry; and Thomas Andrew, 4, was at school. The family had one domestic servant, a young girl called Alice Bradley, 14, from Hertford Heath. The name of Wigginton was associated with this building until c. 2006 when the gift shop at this address in St Andrew Street and the nearby furniture store at Old Cross, both of which traded as Wigginton’s, were finally closed. The business directories of the time, however, list a corn and coal merchant, John Barber, 24, at this address, although a second address, at 34 Castle Street, is also given for him. It would seem that John’s father, Thomas, also a corn and coal merchant, ran his business solely from Castle Street until c. 1910, but from then on had business premises at No. 2 St Andrew Street as well. In more recent times there was still an advertisement for the seed merchant painted high on the side wall of the building facing Old Cross, but this has now been replaced by one for Longmores solicitors. There was a boot and shoe maker’s shop at No. 4, Skerman & Son. This was run by Hertford-born Alfred George Skerman, 42, a boot maker and dealer, who lived on the premises with his two sisters, Katherine Jane, 37, and Margaret Ethel, 30. The building had seven rooms. Alfred is presumably the ‘Son’ of the shop’s name, but the censuses provide no further information about his father or other family (although see below). No. 6 was a haberdashery, run by Henry George Squires, 76, from Hertford, who is described in the census as a ‘fancy draper’. He lived on the premises, a 9-room building, with his wife Ellen Elizabeth, 72, also from Hertford, and two of their four children – Herbert George, 44, a fancy draper like his father, who assisted him in the business, and Ernest Edward, 32, who worked as a clerk on the railway. Living with them was Mary Ann Skerman, a single lady aged 70, who was Ellen’s sister and presumably related to the Skermans at No. 4. There was a fishmonger, selling both ‘wet and dry’ fish, at No. 8, another large building with nine rooms. Walter Frederick Ramsey, 37, from Hertford, lived there with his wife Lizzie, 38, originally from Dublin, and their four children – Rosie, 11, Walter Douglas, 9, Phillys, 6, and Ivy May, 3, all of whom had been born in Hertford. A fifth child had died. The business directories of the time record a lock-up shop next door at No. 8a, which was occupied during working hours by a grocer, Smith & Son. The census lists a plumber, Francis John Botsford, living at No. 10. Aged 39 and originally from Ridgmont in Bedfordshire, he was married to Annie, 35, from Hertford, and they had two sons, Philip, 5, and Harry, 3. However, all three business directories of the time rather puzzlingly describe the Francis Botsford who had a shop at this address as a confectioner! The name of Botsford remains a familiar one in Hertford today – the ironmonger’s shop in Parliament Square is still trading successfully. No. 12 was another lock-up shop, the premises of a fruiterer and greengrocer, Mrs Anne (Annie) Currell, a 79-year-old widow whose home was at 6 Townshend Street, Hertford. She lived there with her grand-daughter, Annie Barker, 29, from Tottenham in Middlesex, who worked as a dressmaker, her daughter Susanah Ditton, 52, and her son-in-law George Ditton, 49, originally from Buckhurst Hill in Essex. George was a telegraph clerk working for the Great Eastern Railway, which operated out of Liverpool Street station in London and served suburban areas north of London and the East Anglia region. There was a wholesale and retail tobacconists – ‘and cigar & cigarette merchants’ – at No. 14. The business, known as C. & J. Law, was run by Charles Law, 54, from Corsham Side (an earlier name for Neston near Corsham) in Wiltshire. He had been married to Sarah, 52, from Hertford, for 18 years and they had four children (a fifth had died). Lizzie, 23, assisted in the family business, as did Dorothy, 17, while Margery, 15, and Wilfred, 9, were still at school. The family lived away from the shop, in a 6-room building at 5 Old Cross, Hertford. After the entry for No. 14 in the census enumerator’s list there are references to stables, a warehouse and several private houses numbered 16a-16e, but all of these are listed as being in Rix’s Yard, off the main street. There do not appear to be any records for No. 18 in 1911, either in the census or the two main business directories of the time. Frederick Alexander Vines, 57, from Hertford, who was a builder, painter and plumber, had a shop at No. 20. He had been married to Rosa, 50, from London, for 32 years and they had had no fewer than 11 children, five of whom were still living with them in 1911. Frederick Thomas, 21, assisted in the family business; Daisy, 19, was employed as a milliner; Amelia, 16, also assisted in the business; and the two youngest children, Gladys, 13, and Horace, 11, were still at school. The property had seven rooms to accommodate the large family. There was a grocer’s shop, W. H. Brace & Son, at No. 22. William Henry Brace, 44, from Hoddesdon in Hertfordshire, was married to Caroline, 43, from Hertford, and one of his sons, Stanley, 18, assisted him in running the grocery business. He also had three other children – Herbert, 22, who had moved away from home by 1911, and Doris, 15, and Trevor, 13, who were both still at school. Next door at No. 24 was a public house, the King’s Head Inn. The publican and beer retailer was George Chapman, 46, from Hertingfordbury near Hertford, and he lived on the premises, which had six rooms, with his wife Clara, 46, who came from Bromham in Bedfordshire. 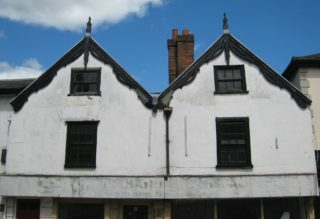 The pub eventually closed in 1955 and became a retail unit, but sadly the early 17th-century twin-gabled building, with its early 19th-century Gothic moulded and traceried bargeboards, has been unoccupied for several years now and looks very neglected. No. 26 was a private house, with six rooms, the home of William Hague Scoley, 43, from Newark in Nottinghamshire, and his family. He was married to Alice, also 43, from Croydon in Surrey, and they had had two children. Their younger son, Percy Henry, 16, born in Hertford, was employed as a farm labourer and still lived at home, and a boarder, George William Young, 23, from Littlemore in Oxfordshire, who was a printer’s compositor, completed the household. William and Alice’s eldest son, William, who would have been 19 in 1911, had moved to London by then, where he lived in a house with 10 other young men, all of whom were employed as shop assistants in the drapery business. William Snr’s occupation was listed in the census as a jobmaster, the term referring to someone who supplied horses, carriages and drivers for hire. The trade directories of the time describe him as a fly proprietor. A fly was a small, one-horse, two-wheeled light carriage and a fly proprietor would have employed fly drivers and probably owned a fleet of fly carriages. The census describes No. 28 as an ‘artillery drill hall’, but it was also the home of Joseph Charles Young, 36, originally from Ipswich in Suffolk, and his family. He and his wife Hettie Lilian, 34, from Colchester in Essex, had five children – Alice Mary, 14, Hettie Lilian, 12, Joseph Sidney, 9, Arthur William, 6, and George Anthony, 3. The first three children had been born in Colchester, but the second two were born in Ireland, in Clonmel and Newbridge respectively. Their father was a Battery Sergt-Major and an instructor in the Royal Field Artillery, so it may be that his two youngest children were born during a military posting to Ireland. The census reference to an ‘artillery drill hall’ relates to the fact that the building was the headquarters of the 4th East Anglian Brigade, Royal Field Artillery Territorial Force and the 1st Hertfordshire Battery, Royal Field Artillery Territorial Force. By 1912 the Herts Yeomanry Territorial Force (B Squadron) was also listed at this address. Among the many officers’ names listed in the various directories covering this period is Battery Sergt-Major Joseph James Young, instructor to the 1st Hertfordshire Battery, Royal Field Artillery Territorial Force – a different second name, but surely this must be the same Joseph Young who lived at No. 28? This large and impressive building was built c. 1725, but was altered and extended in the 20th century. 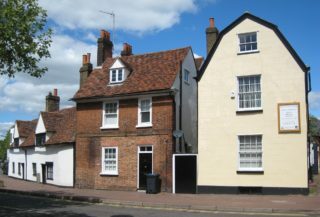 It is now a Grade II* listed building and is regarded as one of the finest in Hertford. Known today as Yeomanry House (formerly Wisteria House), it is still a Territorial Army centre. No. 30 was a large private house with 15 rooms, the home of Jane Eliza Cholmeley, a 78-year-old widow from Islington in London, who was a lady of private means. Two of her eight children were living with her at the time of the 1911 census – Rachel Mary, 47, also with private means, and Annie Marguerite, 30, who was employed as an assistant teacher in a High School. Both daughters had been born in Carleton Rode in Norfolk. Two of Jane’s sisters lived with her as well, neither of whom had married – Mary Fell, 88, from Henley-on-Thames in Oxfordshire, and Emma Selina Fell, 86, from Beckenham in Kent. The household included three domestic servants: Hannah Auger, 71, from Studley in Oxfordshire, was a maid; Elizabeth Emma Server, 32, from Hertford, was a cook; and Daisy Alice Cornhill, 19, from Broxbourne in Hertfordshire was a house parlourmaid. According to the census, William Schooling Smith, from Stanstead [Abbotts] in Hertfordshire, was a sign writer, grainer (someone who painted wood-grain effects on items) and colour man (either a house painter’s assistant or someone who mixed coloured dyes for use on textiles). Kelly’s Directory of Hertfordshire (1910 edition) describes him as a ‘writer & grainer, varnish, colour & brush dealer; agent for Sinclair’s chemical fire engine’ and Bennett’s Business Directory 1911-12 lists him as a ‘brush and colour merchant’. Aged 50, he lived at No. 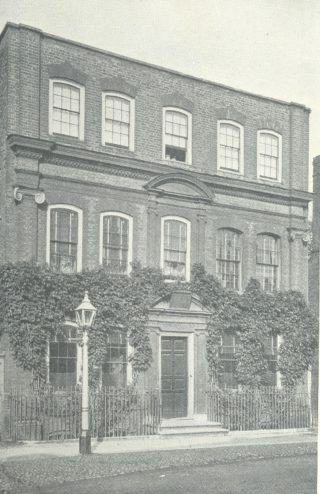 32 (currently called Balfour House), an 8-room private house, with his wife Sarah, 61, also from Stanstead, and three of their children (a fourth had died): Theodora Sarah, 23, assisted her parents in the home and the business; William Munday, 20, also assisted in the business; and Stephen John, 17, was employed as a clerk at a skin-dressing factory, where animal skins were prepared for the manufacture of clothing or footwear. No. 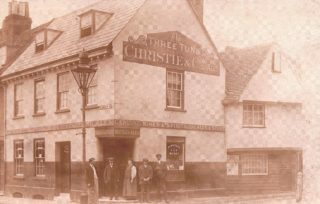 34 was the site of a public house, the Three Tuns, which, as can be seen from the photograph here, offered ‘Christie & Co’s sparkling ales, genuine wines & spirits, fine ales & stout’. Between December 1910 and April 1912 the publican was Colin Lees, 39, originally from Hanley in Staffordshire. He was married to Lily, 32, from Silverdale in Staffordshire, and they lived on the premises, which had eight rooms, with their six children (a seventh had died) – Lily Maud, 11, Alice Victoria, 9, Nora, 8, Mabel Annie, 7, Colin, 4, and the baby of the family Francis George, less than 2 months old. The census describes Colin Snr as an ‘army pensioner’ and it would appear that he had been posted to northern India for several years as all of his children, with the exception of the baby, had been born there. Colin Jnr was born in Hertford. The Three Tuns was originally called the Black Lyon and the building was in two parts – the front dates from 1700, but the rear is older. It is now the site of Baan Thitiya, a Thai restaurant. No. 36 was a private house, with six rooms, the home of Rosa Jane Nightingall, a 67-year-old widow, from Stotfold in Bedfordshire. She was a dressmaker by trade and had two children, both of whom had been born in Hertford and were still living with her in 1911. George, 32, was employed as a steam pipe fitter and Rosa Emily, 28, was a dressmaker like her mother. At No. 38, just two doors down from the Three Tuns, was another public house, the Little Bell, where ‘ales and spirits of the best brands’ could be found, according to Bennett’s Business Directory 1911-12. The proprietor and licensed victualler was John Coulson, 37, from St Giles-in-the-Fields in London, and he was married to Liley [sic], 31, from Soho in London, who assisted him in the business. They had two children – Samuel, 8, born in St Martin-in-the-Fields in London, and Irene, 5, born in Great Amwell in Hertfordshire. The inn closed in 1959 and the 7-room building is now the premises of a hairdresser called Belles & Shears – the name is probably a coincidence, but maybe it’s a subtle reference to the name of the former inn! No. 40 was the home of Alfred Charles Dickins, Jnr, 43, from Hertford, and his family. 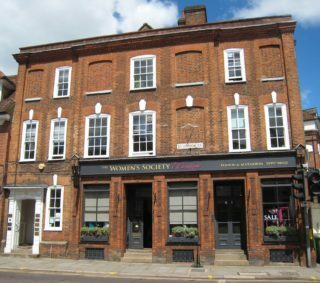 He was a hairdresser, with work premises at 25 Fore Street, Hertford, and was following in the footsteps of his father, also called Alfred Charles Dickens, whose hairdressing business was at No. 7 St Andrew Street (see The south side). Alfred Jnr had been married to Amelia, 44, from East End, Boldre, in Hampshire, for 18 years and they had three children, all of whom had been born in Hertford. Winifred May, 17, was an assistant schoolmistress in an Elementary School and Charles Paige, 16, was employed as a junior clerk for Hertfordshire County Council (in Education). The youngest child was Alfred Henry, 5. The family lived in eight rooms in the property and a domestic servant, Lily Rayment, 16, from Ware in Hertfordshire, lived in and worked for them. A separate census record lists a lodger at the same address, in what would appear to be a 2-room apartment. His name was Hubert Turner Peter Royle, a single 24-year-old, originally from Altrincham in Cheshire, and he was a solicitor’s articled clerk. There was a shop at No. 42 which, according to Bennett’s Business Directory 1911-12 and Kelly’s Directory of Hertfordshire (1912 edition), was run by a Mrs Louisa Emily Braden. She is described as a shopkeeper/general dealer, but it is not clear exactly who she was (there is no mention of her in either the 1901 or 1911 censuses). However, Kelly’s Directory of Hertfordshire (1910 edition) lists a Mrs Emma Braden as the shopkeeper at No. 42. The 1911 census tells us that she was the 63-year-old widow of Thomas P. Braden, both from Hertford, and that she was living at this address with two of her four children – Mary Ann, 33, a domestic worker, and Lotty, 28, who was a dressmaker. Emma’s other daughters were called Amy and Emily, but the 1911 census has no record of them with the surname Braden so it is likely that they had both married and moved away from home by then. No. 44 was a large private residence, with seven rooms, the home of James Kiddill Moulton, a single man aged 49, originally from Holborn in London. 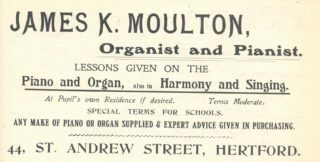 He was a music teacher, offering lessons for organ and piano, as well as singing tuition. He also gave advice on the purchase of both instruments and supplied them if required. He had a housekeeper, Eliza Louise Briggs, 53, from Rochester in Kent, who lived in. Next door, at No. 46, was the home of George Charles Cook, 42, from Braughing in Hertfordshire, who was employed as a chauffeur to a doctor. He had been married to Sarah, 41, from Ware in Hertfordshire, for 18 years and they had a 12-year-old son, Victor George, who had been born in Hertford. There was a doctor’s surgery at No. 48 (not used as a residence) – quite possibly that of the doctor for whom George Cook was a chauffeur. No. 50 (currently called Riverdene House) was the substantial 10-room home of physician and surgeon James Burnett Smith, MB, CM, LRCP, LRCS (Edin. ), 53, originally from Montrose in Forfarshire (now Angus), Scotland. He must surely be the doctor referred to above. He was also, according to Kelly’s Directory of Hertfordshire (1912 edition), ‘medical officer & public vaccinator to No. 1 district, Hertford union & medical officer to the Workhouse’. His wife of 30 years was Annie, 51, from Leith in Midlothian, and they had had two children – Effie, 17, born in London, and a son, Edward (Eddie), also born in London, who tragically had died in a shooting accident in September 1910, aged about 15. Two domestic servants lived in – Rose Edith Taylor, 21, from Hertford, and Maud Figg, 21, from Huntingdon in Huntingdonshire (now Cambridgeshire). James Burnett Smith was clearly an eminent physician, but interestingly his wife had an equally successful career of her own as a journalist and popular author of over 200 novels (romantic fiction for young women), serials, short stories and poetry. She used her maiden name, Annie Shepherd Swan, for most of her literary career, but she also wrote under the name David Lyall and later as Mrs Burnett Smith. Her best-known novel was a romance set in the Scottish Borders, entitled Aldersyde (published in 1883), for which she received complimentary comments from Lord Tennyson and the then prime minister, William Gladstone. In 1930 she was honoured with a CBE for her contribution to literature and four years later her autobiography, My Life, was published. Annie was also a well-regarded public speaker and had an active interest in politics. She became a well-known suffragist and was the first female candidate to stand (for the Liberal Party) in the 1922 General Election, representing a Glasgow constituency, although she was unsuccessful in gaining a parliamentary seat. No. 52 was another large private residence, known as Cecil House (or Dr Hart’s House, presumably after a former resident). This impressive 18th-century townhouse, 1774-8, with its 13 rooms, is now Grade II* listed and is notable for its fashionable porch and doorcase. In 1911 it was the home of James Farley, 55, from Burton Lazars in Leicestershire, who was a builder. His wife of 30 years was Mary Jane, 57, from East Grinstead in Sussex, and they had had seven children, of whom one still lived with them. Minnie Payne, 21, born in Hertford, was employed as a clerk to a builder, presumably her father. 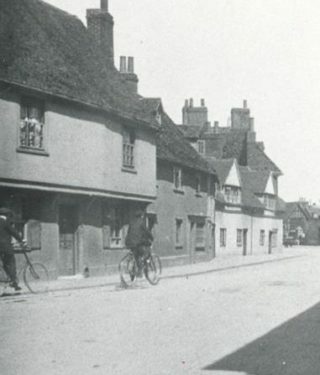 A domestic servant, Gertrude Kate Potkins, 21, from Hertford Heath near Hertford, lived in. On the day of the census the family had an overnight visitor, Eleanor Calvent, 38, born in Dulwich in London, who was employed as a governess. Cedric William Selway, 37, from Lambeth in Surrey, lived next door at No. 54, a spacious house with seven rooms. This late 18th-/early 19th-century timber-framed and plastered building, with its distinctive Welsh-slated gambrel roof, is now Grade II listed. Cedric was employed as Secretary to the Philanthropic Society. This was an organization founded in 1788 in London to address the problems of homeless children who were begging and stealing on the streets. The Society opened homes where these children and young offenders were trained in cottage industries by skilled tradesmen. In 1849 the Society established a Farm School for boys in Redhill, Surrey, where training was provided in agricultural work and farmyard management, as well as various other skills and trades. Cedric was married to Ada Anne, 38, from Notting Hill in Middlesex. One of their two children, Jessy Maud, 10, born in Wembley in Middlesex, lived with them, as did a domestic servant, Eliza Parker, 16, from the quaintly named village of Nasty near Great Munden in Hertfordshire. The building next door, No. 56, is recorded as ‘uninhabited’ on the day of the census, but the enumerator lists the property as a private house with a Mr Carter at this address. The 1901 census records a Henry Carter and his family living here and the 1910 edition of Kelly’s Directory of Hertfordshire also refers to him residing at No. 56. Henry, 33, from Hertford, was a land agent’s assistant. He was married to Agnes, 38, originally from Manchester in Lancashire, whose mother, Eliza Cookson, a 67-year-old widow from Ruabon in Denbighshire, North Wales, lived with them. The household also included one domestic servant, Elizabeth Field, 34, a local girl from Hertford. Miss Lucy Lydia Gardner, 50, from Plumstead in Kent, lived at No. 58, a property which had five rooms. She was a civil servant working for the General Post Office (GPO) as a telegraph and sorting clerk. This cottage and the adjacent one at No. 60 are among the oldest in the street, dating from the late 16th century. They are both now Grade II listed. The 5-room private residence at No. 60 was the home of Joseph Alderton, 72, from Cambridge, who was a jobbing tailor, and his wife Ann, 66, from Roydon in Essex. Of the nine children they had had, three had died and two still lived with them. Sophia Ellen, 37, born in Whitwell in Hertfordshire, was unmarried and was employed as a ‘plain needleworker’. Another daughter, Annie Barnett, 31, born in Hertford, was married and she also lived there with her 5-year-old son, Sydney Joseph, who had been born in Charlton in Kent. She had married Sydney John Barnett in 1905, but it is not clear where he was when the census was taken. Henry Sweeney, 42, from Ware in Hertfordshire, lived next door at No. 62. He was a general dealer by trade and was married to Emily, 36, also from Ware. They had three sons – Henry, 10, Clemen, 7, and Reginald, 6, all of whom had been born in Hertford. The family had taken in a young boarder, William Crouch, 14, from Ware, who worked as a general labourer. No. 64 was the home of a boot maker/repairer, Edward William Baldwin, 45, and his wife Mary Ann, 46, both from Bengeo in Hertford. Sadly their only child had died. There are no records relating to No. 66 in the street. No. 68, a private house with six rooms, was occupied by William Raven, 48, originally from Gilston in Hertfordshire, and his family. He was employed as a carman (a delivery man) for a wine merchant. His wife of 21 years was Hertford-born Alice, 42, and they had two children. Arthur William, 19, born in Gilston, was a sawyer (someone who used a saw to cut wood and who may have been employed in the timber industry or in other areas of manufacturing). Doris, 9, born in Hertford, was still at school. They had a boarder, Ralph Burch, 22, originally from Tattingstone in Suffolk and now employed as a harness maker, living with them. The last house on this side of the street was No. 70. It was the 7-room home of James George Brown, 31, from Forest Hill in Kent, who worked as a laundryman, and his wife Ellen, 30, from Barnes in Surrey, who was a laundress. They had one surviving child (two others had died) – Ellen Jessie, 3. They obviously lived on the premises where they worked, while the proprietor of the laundry, Harry Langton, 45, from Wandsworth in London, lived at No. 33 North Road, Hertford, with his wife Edith, 45, their three sons and a domestic servant. This page was added on 21/01/2015. I was born in George st in 1938 and was an apprentice with Botsford and son from the age of 15. The old man Botsford was still working in the office then but Harry ran the business. His brother opened the shop selling hardware near the town hall. I have many interesting that I could tell. Thank you for your comment. William E. North was living at 65g Pavitt’s Yard in 1911, according to the census taken in that year. He must have moved to No. 62 sometime after that. Pavitt’s Yard, which was also known as Kiddill’s or Hattam’s Yard, was located behind No. 65 St Andrew Street. All the buildings in this section of the street were demolished when Gascoyne Way was built in the 1960s. 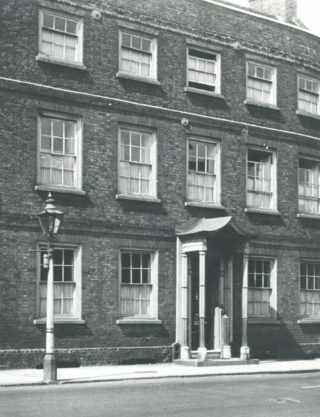 No 62 was occupied by William E North (from Watton), his wife Ada (nee Florence from Stapleford) and son Joseph W North. William was a Miller’s Carman. He was previously shown as living at 65G Pavitts Yd, St Andrew Street.